Here are a few rough ideas for my final images. The project has developed into a series of images, which display severed body parts. This takes inspiration from typical images of the illegal animal and bushmeat trades, which I aim to highlight in this series titled ‘If They Were Human’. 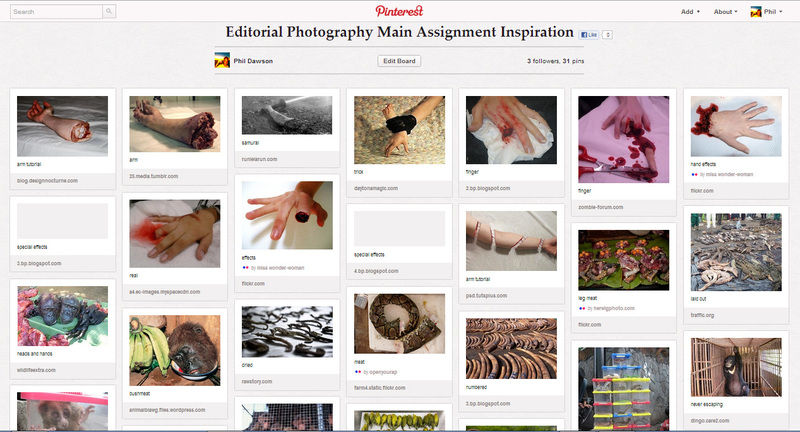 You can see research images on this subject on my Pinterest moodboard. The assignment brief required us to create a scene, which would be photographed twice using different lighting for each image. The challenge was to change the mood, and therefore, meaning conveyed purely with the use of lighting. 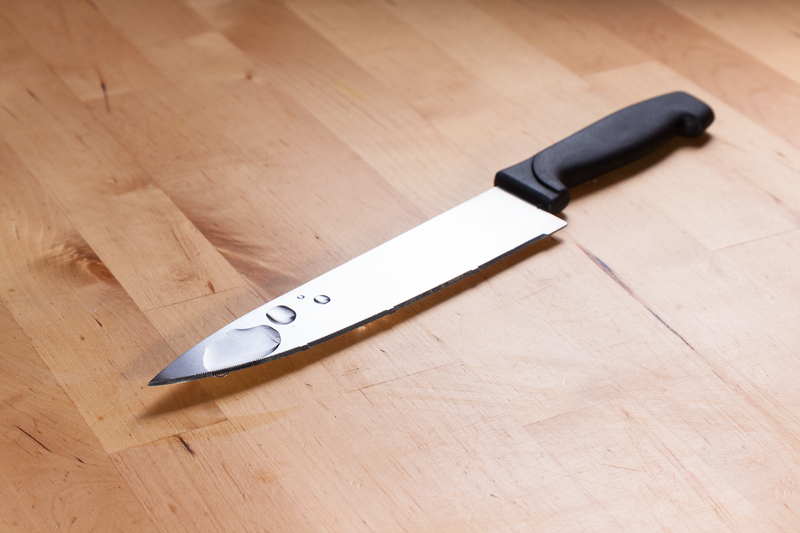 The image I chose to construct was that of a large knife on a kitchen table with a few spots of water on the blade – an image, which would offer vastly differing narratives dependent on the lighting used. Below you can see the first image – the well-lit, clean, commercial product shot. I lit this using two diffused flashes with make-shift softboxes, one beneath camera and the other behind and to the right of the subject. You can see better how this was set-up in the diagram below. As I have already mentioned, I feel that the result achieved is one akin to a typical still-life / product / stock image. The lighting is even and soft, giving pleasing shadows and good focus to the subject. In its second form, the feel of the image is altered entirely. 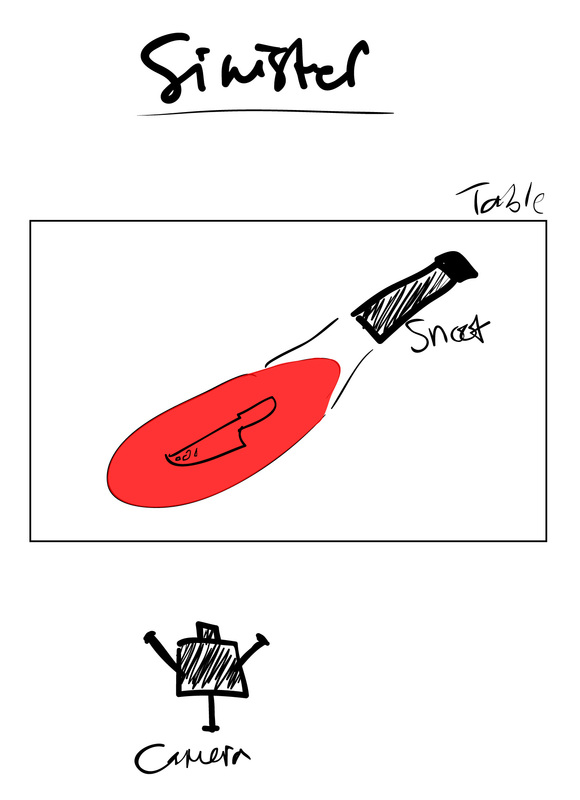 Instantly, the red colour and sinister lighting conveys a sense of evil, and in this particular image, murder. This image was lit using one flash with a red gel and a long semi-opaque snoot to focus the light around the knife, whilst still allowing some ambient fill light. By lighting the image in this way, the atmosphere shifts to convey a dark, sinister mood. 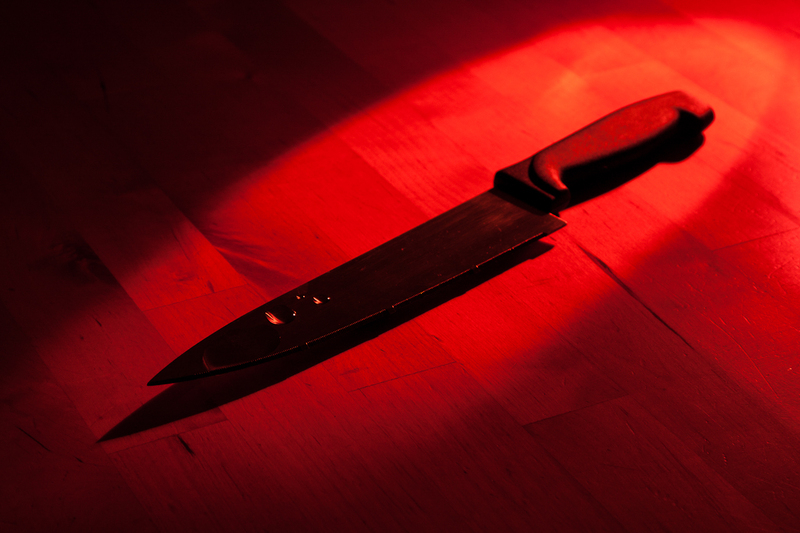 Low-key lighting and long shadows (techniques we often see used in horror films) cast by the blade of the knife create a look we associate with wicked and evil circumstances, and this changes the tone of the scene entirely. This assignment required us to create an art direction concept and a final constructed image. We did this by collating a set of images, which would act as a moodboard and help to inspire us in creating our concept. We then came up with an idea and storyboard, which set out exactly how the finished image would look, before finally creating and photographing the scene. The initial idea I had come up with was simply ‘mouldy food’, but photographed in a way that is common in typical food photography, i.e. well-presented, clean, attractive, simple, subject-focused. My moodboard (below) features a selection of images portraying different food in this way. However, I have also included some images of mouldy food, including several by artist Klaus Pichler, whose work relates particularly well to my final image. 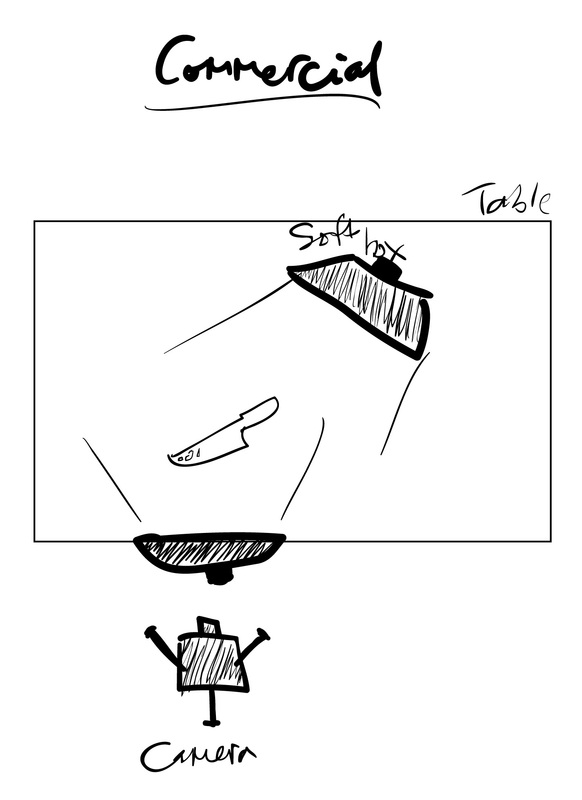 After researching statistics on food wastage in the UK, and finding that an astonishing 32% of all purchased bread is wasted, but before storyboarding my image, I played around with angles and lighting set-ups to figure out what was achievable, but would also provide the best results. 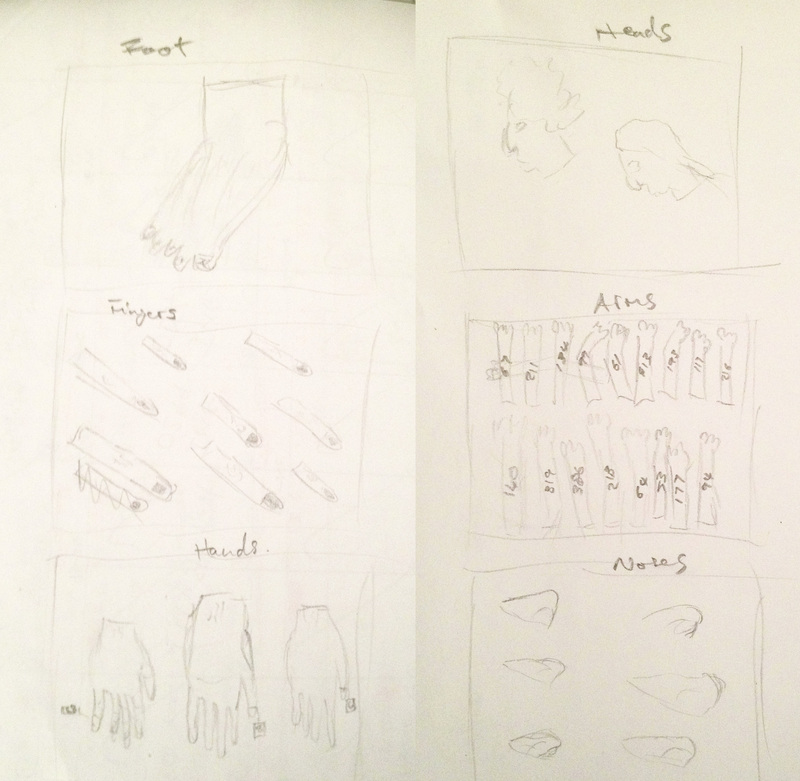 From my findings, I finalised the image concept and sketched it out as the below storyboard. Clearly the final image changed slightly due to what worked best in post-production. 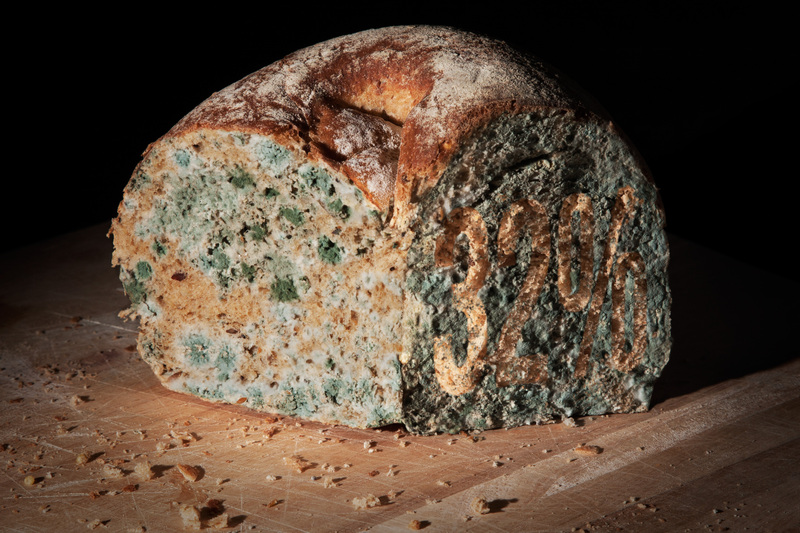 The final image is constructed from two images – one of very mouldy bread, and the other of the ideal bread shape. 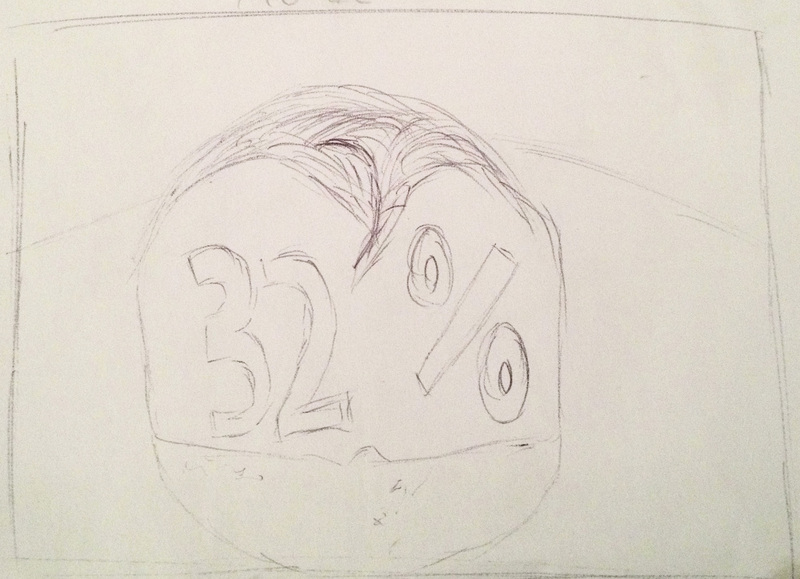 A lot of Photoshop work went in to achieving a seamless cohesion between the two, especially in the area of the ‘32%’, which appears on the right of the cut bread. Today’s class was based around art direction, storyboarding and image creation. We looked at the differing styles of several photographers / artists, including Ian McKinnel, Anders & Low, Sam Faulkner and Franz Pagot. Of the artists we looked at, I was particularly taken by Sam Faulkner’s photographic project named Eagle Hunters, which is a series of wonderfully crisp portraits of Kazakh people from Nura, who hunt for sport with huge birds of prey. 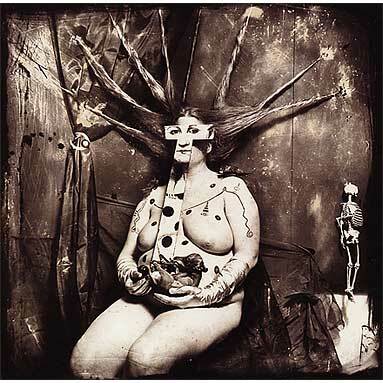 The photographer has clearly found an extraordinary subject to focus on, which presented a solid photographic project. During the class we were set a new photo assignment, which tasks us with taking inspiration from our mood board, creating an art direction concept, visualising and storyboarding an image, and then photographing that image with any necessary props. I have decided to create a still life image inspired by Klaus Pichler’s One Third series, which highlights the problem of food waste in modern society. At this point in time I intend to create an image featuring mouldy food in a similar fashion, but with a human element involved, which will highlight the issue of poverty and starvation, as well as food waste. This human element may be presented simply in the form of a hand reaching for the food, as I do not want to draw attention away from the rotting food entirely. However, I will continue to add to my mood board and formulate a strong concept, which allows me to tackle the issue with clarity. Following on from art direction, styling is a key component in what makes editorial photography tick. A stylist will take the brief, and any ideas or inspiration, which need to be incorporated into the desired final images and come up with a ‘look’ for models. A good stylist will have a keen eye for detail, exhaustive knowledge of the fashion industry and be at the forefront of what is new, unique and visually exciting. A stylist is another important set of creative eyes, who can add a lot to the process of creating a quality editorial photograph. Depending on the requirements of my project, I will be looking at implementing the creative input of a stylist or some of the techniques a stylist would use. I will do this by researching relevant fashion trends.